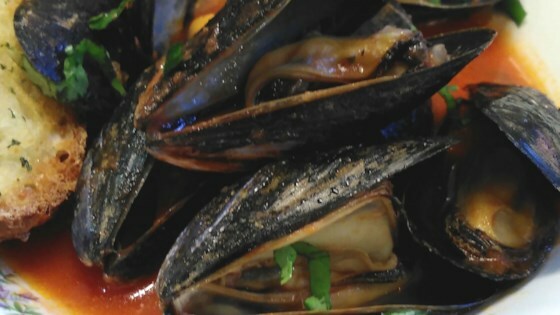 "These mussels have a fresh tomato basil broth with white wine and lobster stock and a duck-fat grilled crostini." Heat olive oil in saucepan over medium heat. Add shallots and garlic; cook and stir until softened, 1 or 2 minutes. Pour in white wine, lobster stock, and tomato sauce. Increase heat to medium-high and bring to a simmer. Add mussels. Cover and cook until mussels open, 4 to 6 minutes. Discard any mussels that don't open. Rub baguette with duck fat on cut sides. Place on a baking sheet and set under broiler. Broil until browned and crunchy, 1 to 2 minutes. Divide mussels between 2 serving bowls. Pour broth over mussels. Top with sliced basil. Serve with crunchy baguette. See how to make quick, delicious mussels steamed in white wine. You can also grill the baguette until browned and crisp.